I haven't posted much lately because, frankly, there haven't been very many dinner parties to write about. We've been holed up on the couch with the dog, ordering in take out, having friends over for a drink before having dinner out somewhere. And having our usual weeknight eating-in-front-of-the-TV suppers. But warmer weather is here, which always renews my enthusiasm for being social. I'm not sure why -- shrugging off the hibernation mentality that comes with winter, I guess. 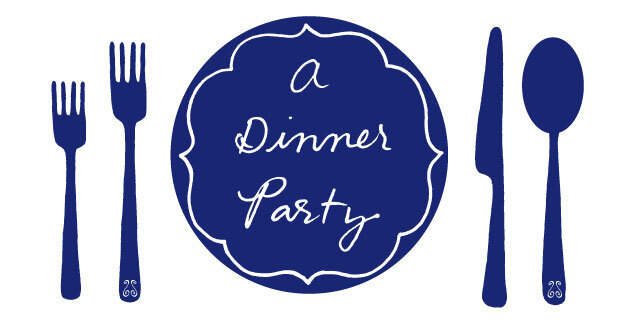 I did make something recently that would be perfect for a dinner party. It's chicken but it's not boring, there is minimal clean-up, and it's basically a one dish -- or pan -- meal. It's from a Bon Appetit story on "one-sheet" dinners and it's smart in a "Why didn't I think of that?" kind of way. 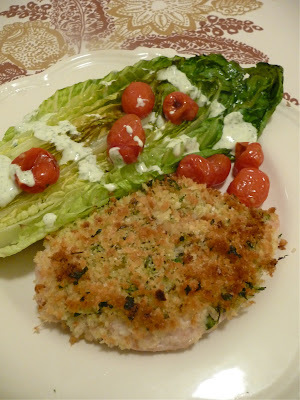 I tried the recipe for parmesan chicken with Caesar roasted romaine because I've always wanted an excuse to make a grilled romaine salad, after trying different versions in several restaurants. The recipe has you top chicken breasts with a garlicky, herby breadcrumb mixture, then bake them in the oven alongside some hearts of romaine. You finish the dish with a squeeze of lemon and some anchovies on the lettuce, for a twist on a Caesar salad. Well, I'm not an anchovy fan. I can eat them pureed into a sauce or minced finely atop a savory tart, but I can't seem to get down an entire anchovy filet. You can take away my foodie license now. So I skipped the anchovies and whipped up a creamy tarragon dressing to drizzle over the romaine, replacing some of the fat and salt from the fish. I also roasted some tomatoes because I had them on hand. The combination of the crispy breadcrumbs, juicy chicken and slightly cooked romaine was really delicious. And I think my addition of the tomatoes and tarragon dressing made it even better. You can find chicken Caesar salad in any mall or chain restaurant in America. This is not that salad. The whole thing looked pretty on a plate, making it "company-worthy," as they say. But it was also fine eaten on a Monday night as we watched The Voice, where we both managed to look up from the screen to comment on how good the food was. The ultimate weeknight test. Preheat your oven to 450 degrees. Line a large rimmed baking sheet with foil. Season the chicken with salt and pepper; place on prepared sheet. In a small bowl, combine cheese, panko, 2 Tbsp. oil, parsley, and garlic; season with salt and pepper. Pat panko mixture onto breasts. Place the cherry tomatoes on a sheet of foil and drizzle with olive oil. Fold the foil inward, like a packet and close the top of the packet. Place the packet alongside the chicken breasts, or on another cookie sheet if you don't have room for the romaine as well. Drizzle romaine with 1 Tbsp. oil. Season with salt and pepper. Remove sheet from oven; place romaine around chicken. Roast until chicken is cooked through and lettuce is browned at edges, about 5 minutes. While the lettuce is cooking, combine the yogurt, mayo, tarragon and lemon juice in a small bowl and whisk until combined. Add salt and pepper to taste. Divide the chicken, lettuce and tomatoes among plates. Drizzle the dressing over the lettuce and serve. I'm making this tonight. I'll let you know how it turns out when I see you tomorrow! I know you don't like anchovies, but I must say, I love the phrase "minced finely atop a savory tart." Kind of sounds like a good way to die.